The Serengeti has mythological appeal; it is a primal call. 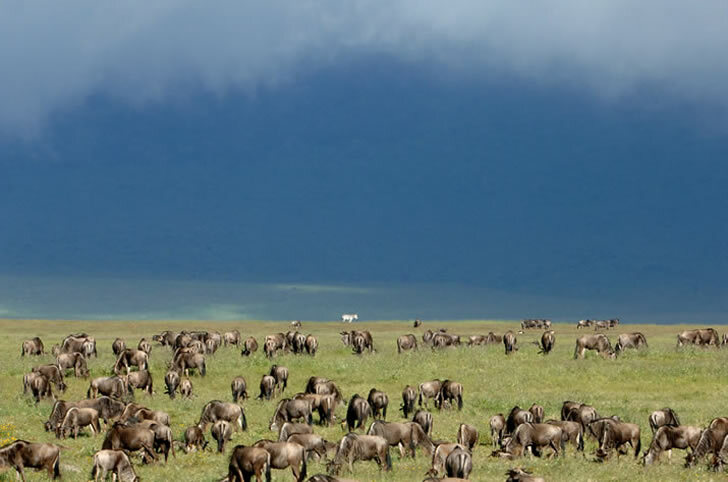 On a planet in trouble, it is also a profound and important place, sustaining (along with the Masai Mara in Kenya) the massive herds with the instinct and the space to migrate year after year. The safari experience here is single-mindedly focused on this phenomenon of wildlife, with a dash of 1920s safari romance thrown in if you are in the company of &BEYOND (formerly CC Africa). 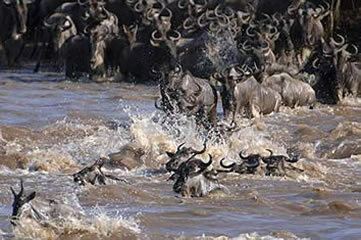 The Great Migration outnumbers human beings in the area by about a million to one and is a sight to behold. It is hard to grasp, even in the midst of it. Wildebeest and zebra colonise vast areas, giving the landscape the appearance of outsized anthills, grunting and barking to each other endlessly and sending up dust like smoke signals. On the move, the wildebeest (the main players) are determined and relentless, heads down, three abreast; a winding army with a single pursuit, sounding like waves. The effect is hypnotic. Most people associate the migration with the gruesome crossing of the Grumeti and Mara Rivers made famous by many a wildlife documentary, where enormous crocodiles await their easy prey, but these animals are, in fact, on the go throughout the year. 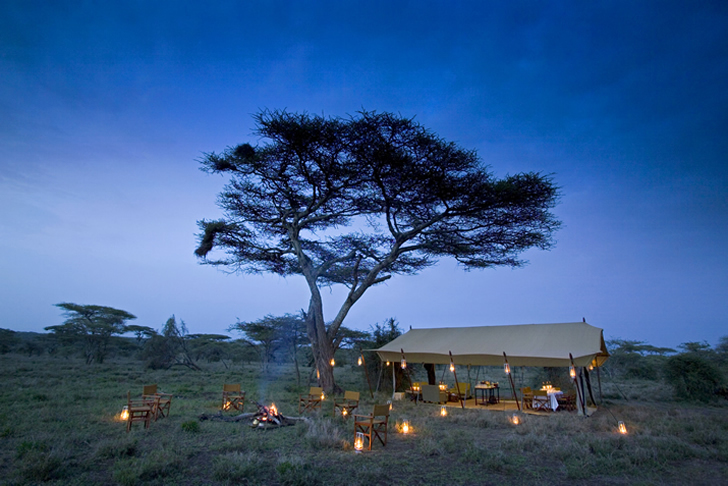 &BEYOND, the masters of the eco-conscious, beneficial, high-end wildlife experience operate luxury mobile camps called Under Canvas that follow the migration through the Serengeti, stopping in each area for about two months while the herds move through. 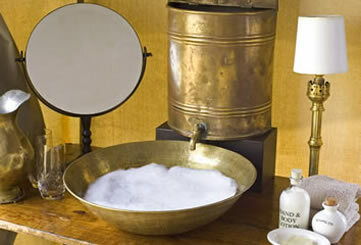 These gracious tented camps are inspired by those fine-living explorers who �even took the gramophone on safari� � cut crystal, silverware, china, beautiful brass basins, flushing toilets and a one-to-one staff to guest ratio sort of thing. 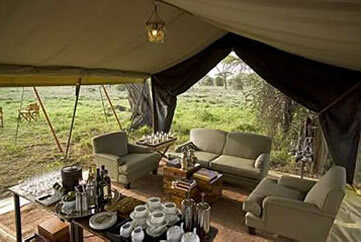 Our camp was on a hillside in a semi-woodland area, under flat-topped acacias, overlooking a vast plain. 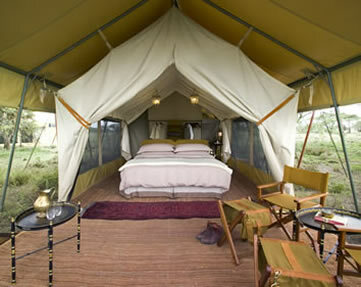 Giraffe moved through the camp in the early morning, breakfasting on the trees overhanging the tents. Being in the midst of the migration, we slept to the sound of grunting gnus � much like frogs � and awoke to them running though the bush near us. This and the flimsy barrier of canvas between man and wilderness create a thrilling feeling of merging with the environment. One night while sitting out under the stars gazing into the fire, we heard that punched in the stomach exhalation of sound that is the male lion calling very close by. It was impossible to see beyond the circle of firelight but we heard frightened wildebeest moving in the bush only a few metres away. Very soon, a bellow signalled that one of them had been brought down. Having been raised and living in Africa, �the bush� is familiar. It can also be commercial and often tailored to the extreme with even animal sightings seeming orchestrated. Here though the animals are truly wild � they operate to ancient rhythms, move in great herds (elephant herds of thirty or more!) and are often impossible to find. 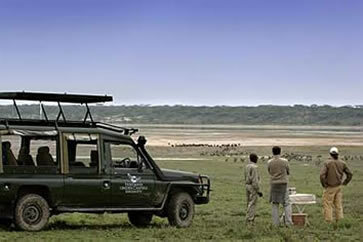 There are other tour operators in the Serengeti and their experience may be of a different making, but when respect for the land, animals and people is the mantra (as it is for &BEYOND) in this very wild place, you are able to grasp the ideal of harmony, especially if you ask your ranger to slow the pursuit of wildlife down. Though you can limit your safari to one area, &BEYOND has numerous lodges in Tanzania and it would be a pity to leave without sampling at least one more. You will have to fly to access them, unless you have the time and the inclination to travel for days. Air travel, though, is a worthwhile part of the adventure. Tanzania has a variety of landscapes and they are beautiful to behold unfurling beneath you. Small airports are dotted about and the characters inhabiting them or flying the planes are fascinating too. 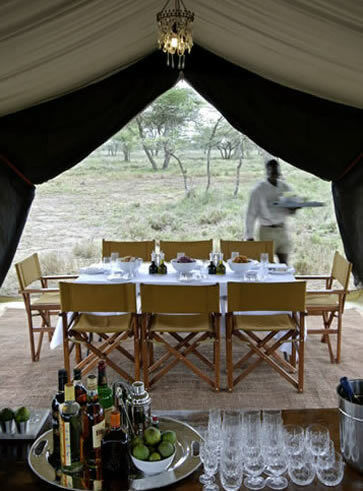 * When you are not Under Canvas in the Serengeti, you may be pestered by tsetse flies, so along with an anti-histamine, pack pants or long trousers that have a drawstring at the ankles and long sleeved, light cotton tops. This works for mosquitoes too. * In the spirit of the 1920s, take along an old book of poetry.